We are a team of IT professionals willing to provide real time training candidates who are in need. jeevanopadhi.com is a considered as best software training institute at uppaldepot, hyderabad which provides training and placements. Any candidate who has dream of Software / IT job can join our institute. We have multiple batches for Btech, Mtech ,working professionals.We also have weekend batches and Internship programme. We are delighted to inform that all our candidates are placed in MNC companies. We offer Msoffice, C ,core java,advance java, dotnet , oracle, webdesign, SEO, php,android,website developement, hadoop. Just after the training, the candidates are assigned a real time project .Upon successful completion of project , the candidate is more confident then earlier. 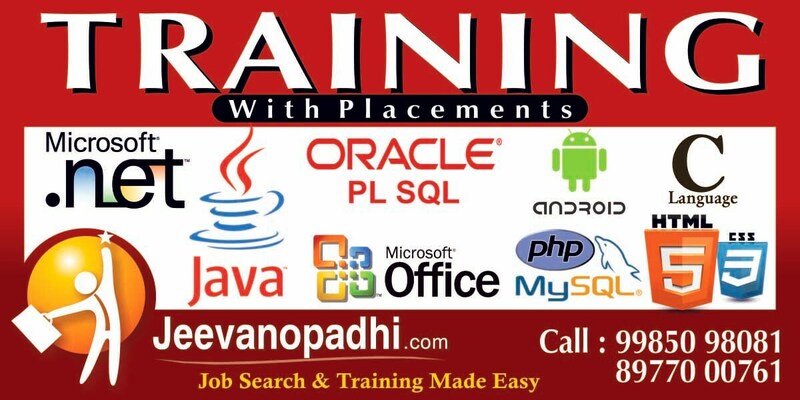 Jeevanopadhi.com also shows various walkins and job offers avalibale in Hyderabad and other parts of India as it has its own recruitment team. This entry was posted in software and tagged android at uppal, best software training institute in hyderabad, best software training institute in uppal, c language in uppal, computer institute at uppal depot, Computer Training Institutes, Computer Training Institutes For Advanced Java, Computer Training Institutes For Android, Computer Training Institutes For Dot Net, Computer Training Institutes For Java, Computer Training Institutes For Java Core, Computer Training Institutes For MS Office, Computer Training Institutes For Oracle DBA, Computer Training Institutes For wordpress, core java at uppal, digital marketing at uppal, dotnet at uppal, java at uppal, java training at uppal, php at uppal, Programming Training Institutes, software training institute in uppal, Software Training Institutes, sql training at uppal depot. Bookmark the permalink.